In the pharmaceutical industry, compliance to regulations and guidelines, such as CSV, Ministry of Health, Labour and Wel f a re ERIES guidelines and FDA 21 CFR Part 11, and the proper, efficient management of instruments and analytical data is required. Since all analytical data is managed in the database of a server computer, LabSolutions CS can read data from any personal computer on a network. 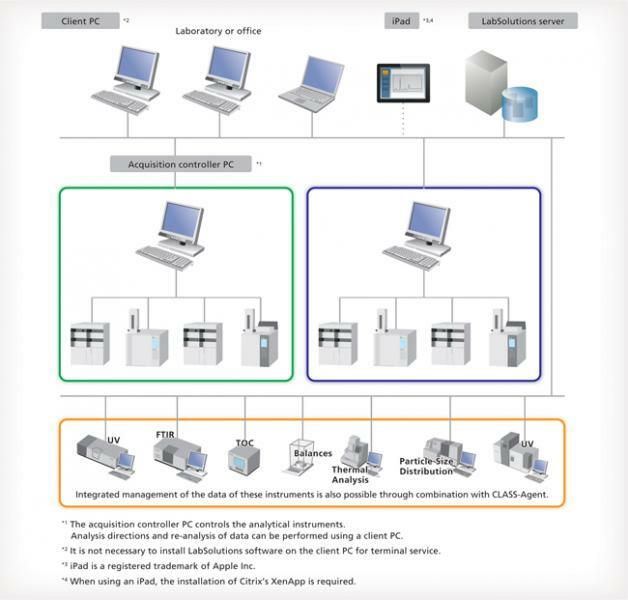 In addition, analysis directions and instrument monitoring and control can be performed from a personal computer (client PC) not connected to the instruments. Moreover, client PC functions are performed on a server and client PCs corresponding to a Windows terminal service do not need to install LabSolutions software. Furthermore, LabSolutions CS is compatible with Citrix XenApp and can perform more advanced server management.